Rebecca Kiss/Assistant Photo Editor Erin Sausville, a senior double-majoring in environmental studies and biology, and Maya Wechsler, a senior majoring in art, discuss Wechsler's photography, on display at “Art @ INK.” The event was held at the Koffman Southern Tier Incubator as part of December’s First Friday in Downtown Binghamton. 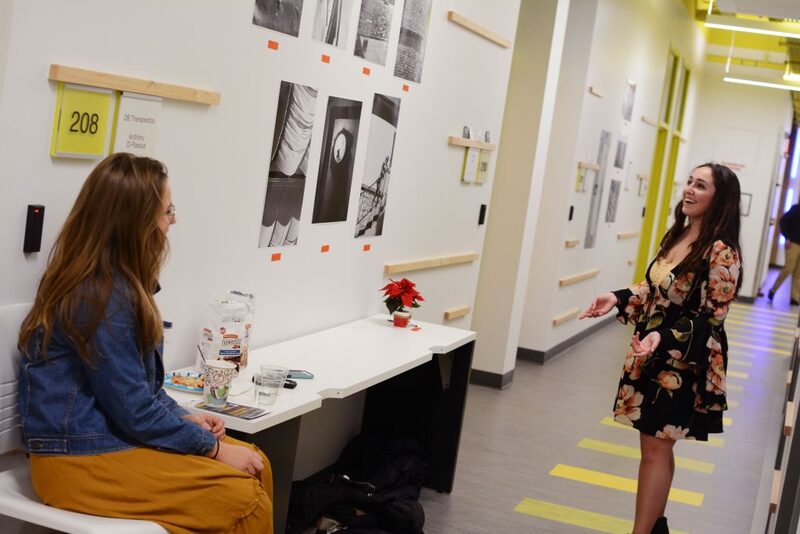 The Koffman Southern Tier Incubator showed First Friday participants that the artistic process is quite similar to the entrepreneurial one. Friday night’s show, “Art @ INK,” featured work by student artists, musicians and entrepreneurs. At the event, over 20 BU students displayed work of various media, including photography, drawing and painting. Many students took the exhibition opportunity as a chance to promote themselves as artists. Lucy Wong, a sophomore majoring in business administration, displayed her “#instafamous” collection alongside stickers she was selling for $1 and Cassie Armon, a senior majoring in English, showed a few pieces next to copies of the Free Press, a campus publication for which she is an illustrator. Taylor Hayes, a senior majoring in art, showed work inspired by a surreal interpretation of nature. Hayes said she also found the event to be positive in terms of advertising. Although the new business incubator has only been open since April 4, it has not taken long for the facility to expand its reach into the community with events like this showcase. The incubator looks for companies that can “come in, grow, hire people and move out into the community,” Holmes said. In order to foster this, the facility has a series of mentors and a three-phase program for growth. In addition, the incubator creates networking opportunities for students and community businesses. Kathryn Cherny, a fourth-year graduate student studying biology, has used the incubator to help establish her small business. Cherny began the process of creating microBELLA, a cosmetics and “natural AF skin care” company, in January. Cherny brought two different soap prototypes to the First Friday event and took the time to educate her audience about her product and even offered free samples, using the occasion as an opportunity to promote her small business. Cherny said that the incubator has been helpful in securing her lab space and offering her connections with faculty, who have aided her in combining her love of skin care and knowledge of bacteria. Kat Catus, a junior majoring in art, was one of many students and community members in attendance at the event. Catus remarked that this type of art scene was especially appealing due to its appreciative nature.